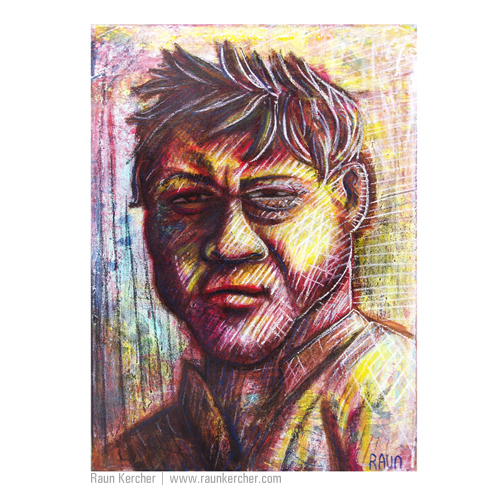 Raun Kercher’s art work is a naive art style generated by projection of subconscious narrative vision with focus on emotion, color and light. These components are part of his cultivated style and vision. Art subjects have included some of the most influential innovators of American Jazz, 1960s Delta Blues and Chicago Blues scenes, historic figures and icons, early advertising, and documentations of people, places and time. In addition to creating art Raun Kercher is a freelance web designer and graphic designer at Raun Design. You can see his design work on the Raun Design website. When he is not designing and creating he is enjoying the outdoor activities. Some of his favorite outdoor activities include hiking, biking, fishing and exploring new places. Visit the Raun Fine Art website gallery to view art by series.